It should come as no surprise that this editorial cartooning thing comes easiest when something really and truly ticks you off. 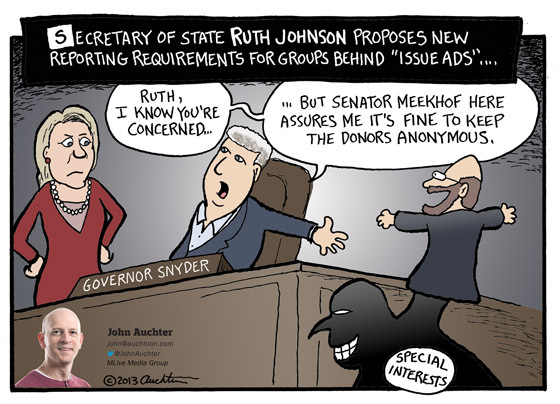 Such is the case when Secretary of State Ruth Johnson recently proposed that Michigan consider some transparency in the financing of so called “issue ads” (Issue ads are those campaign spots that can serve up whatever slanderous bile they want so long as they don’t endorse a candidate. And as a bonus for being slimy, they don’t have to reveal who paid for the ad.) The Supreme Court left it up to the states to decide whether the money source must be revealed. Many states require it. At this point, Michigan does not. And it doesn’t look likely that Michigan will. Because almost immediately after Johnson floated the transparency idea, Senator Arlan Meekhof and senate leader Randy Richardville rammed through a bill to do exactly the opposite — keep the revenue sources anonymous and then doubling the amount allowed to be given. The defense for this (and a rather cynical one at that) is free speech or the claim that donation sources need to be hidden because otherwise those who make them might feel uncomfortable. First, I’m sure they type who have the likes of Senator Meekhof do their bidding are plenty lawyered up to deal with the consequences of being revealed. Second, is it not a virtue to stand up for what you believe in? A Post on the FlintExpats Site! 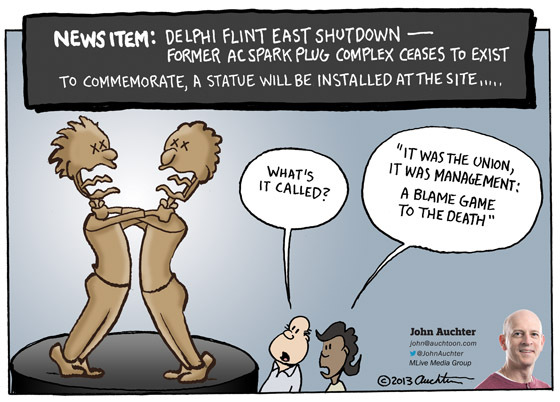 It’s about the recent cartoon I did about the last remnant of the AC Spark Plug complex in Flint recently closing down. But there is also an interesting bit about my drawing table, which happens to have a AC Spark Plug connection. Check it out. And buy Gordie’s book! Christmas is coming — great stocking stuffer for that Flintoid (or Flintoid wannabe) on you list! Hmmm… This is one of those cartoons that felt like it had a strong statement when I did it. Now it seems a little mushy. The point is that politicians on both sides of the aisle tend to be much better with coming up with good ideas than actually executing them. Entitlements are a perfect example. 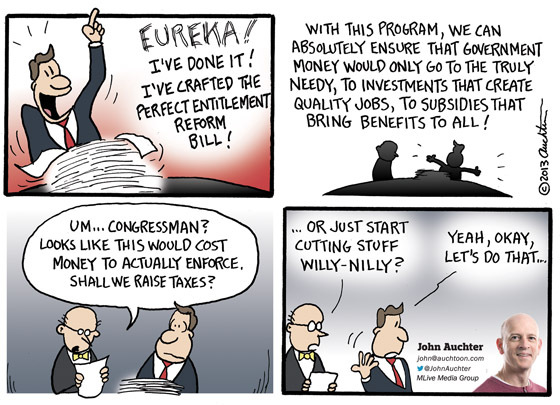 It’s fun to propose programs, project, subsidies, but it’s a drag to figure out how to run them and fund them. Did you guys get that? Well, it was a great idea when I came up with it, but I guess I didn’t feel like figuring out the best way to draw it…..
Yeah, sure. All that and more. But if you’re not from Flint, you have no real appreciation for the subtleties and complexities of how things turned out the way they have. And it’s more than a little annoying to have somebody tell you with great confidence how AC Spark Plug would be a humming beehive of activity if only they had been in charge. I don’t think so. There are historical reasons for why things turned out the way they did. There were some very bad decisions, but there were also some great successes, and we would be wise to learn from both. So the two folks choking each other to death is more of a cautionary tale for those who have never been to Flint but think they know exactly what happened there. I purposely didn’t draw them as a blue collar guy with a lunch bucket and hard hat, and a rich guys with a top hat and monocle. That’s the past. Future problems are more likely to be caused by folks who appear relatively the same but are still playing the blame game. My intention here was to show Michiganders’ greater interest in the next manager of the Detroit Tigers than in the next mayor of our largest city (which, for a while anyway, is still Detroit). The joke kind of hinged on the Tuesday election coming first. Alas for me, the Tigers found their manager and the news leaked Sunday. 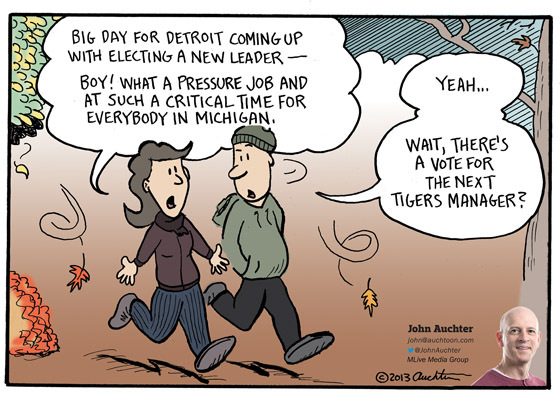 But I think more people probably knowing Brad Ausmus (a journeyman player and first-time manager) than the mayoral candidates (Mike Duggan and Benny Napoleon) also proves the point.